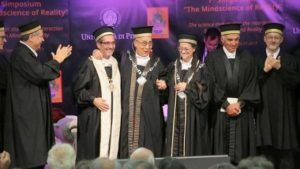 After receiving an honorary degree from the University of Pisa on September 21, the Dalai Lama, a Nobel Peace Prize recipient, said he is just one of us. “I am one of you, a human being like the other 7 billion humans, who try to make a small contribution to building a better world,” said Tenzin Gyatso, the 14th Dalai Lama. The University of Pisa presented His Holiness a degree in clinical psychology for his work in the science of the mind. Dean of the University Paolo Mancarella explained that the Dalai Lama received this honor as a significant contributor to all disciplinary areas of psychology. In his keynote speech, the Dalai Lama thanked the University for his degree, which he said was a representation of his efforts to build a bridge between contemplative sciences of ancient India and modern psychology. He stated that contemplative techniques, such as meditation, can be used to treat diseases, such as depression, addiction, post-traumatic stress disorder and chronic pain. To read what the Dalai Lama said at the Mandela Forum on September 19, including a video and photos of actor Richard Gere in attendance, see the following Firenze Repubblica link.